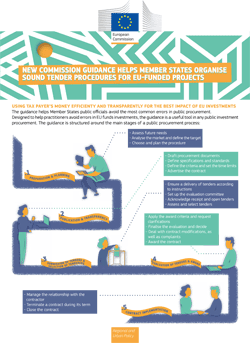 The European Commission published a guide to support public officials across the EU to avoid the most frequent errors and adopt best practices in public procurement of projects funded by the European Structural and Investment Funds (ESIF) and beyond. Public procurement plays a key role in the implementation of those EU investments and is an essential element of the Single Market, representing no less than 19 per cent of the EU's GDP. After a very successful first edition with more than 70,000 downloads, this new version also is updated with the recent EU legislation and explain how to make the most out of the opportunities offered by the revised public procurement directives of 2014, i.e. less red tape and more online procedures to make it easier for small businesses to participate in public tenders and the possibility of introducing new criteria in award decision to choose socially responsible companies and innovative, environment-friendly products. 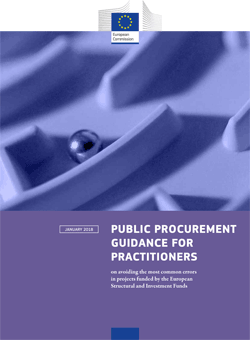 The guide helps to identify and avoid areas of potential risk of errors in public procurement, a major source of irregularities in the management of EU funds. By doing so, this tool will not only ensure regularity and transparency, but will also improve the efficiency and the effectiveness of public procurement with significant potential gains in terms of fair competition and quality of investments for the benefit of the public administrations, the companies involved and the end beneficiaries of the projects. The "Guidance for practitioners on the avoidance of the most common errors in public procurement of projects funded by the European Structural and Investment Funds" contains practical suggestions, series of good practices, real-life examples, explanations on specific topics, case studies and templates and useful links in order to help those who are involved in the day-to-day management of EU-supported projects. It also describes the most common mistakes and explains how to avoid them and how to handle each situation. The guidance will be available in all EU languages. It is one of the concrete actions included in the action plan aimed at helping Member States improve the performance of both administrations and beneficiaries in applying public procurement for EU-supported investments during the 2014-2020 programming period. Other actions include the development of an expert exchange system for Managing authorities to share experiences and expertise in public procurement capacity, the use of Integrity Pacts as a tool to increase transparency and accountability, and the development of country specific action plans for countries non-compliant with the Public procurement ex-ante conditionalities.